For a limited time period, Microsoft is giving Windows 8 for a discounted price of Rs. 1,999 ($39.99) and the users who bought a Windows 7 PC between 2 June 2012 and 31 January 2013 can avail additional discount and buy it for just Rs. 699 ($14.99). Microsoft was giving this discount to only those users who bought their PCs between specified time period but anybody can buy Windows 8 for Rs. 699 by faking the details of your purchase. So even if you haven’t bought any PC between 2 June 2012 and 31 January 2013 you can still get your copy of Windows 8 for huge discounted price. If you never used a genuine copy of Windows, now is the time for you to try a genuine Windows product. I think Microsoft is running this promo to transform more and more pirated Windows users to Genuine users. Step 1. First visit the Windows Upgrade Offer page and select your location from the list of eligible countries. Step 2. Once you have selected your country, click on Continue button on the next page. Step 3. Now enter your personal information. The only important column here is date of purchase. You need to select a day after 2 June 2012 to avail the offer. You can enter any name for retailer and PC model. Step 4. When you submit your personal details, you will get an email with Promo Code. Note down this promo code. You will need it later. Step 5. Now Download Upgrade Assistant on your PC that you want to upgrade. The Upgrade Assistant will check for compatible apps and provide you a report. Once you reach the payment confirmation page, enter you promo code that you received in your email and download Windows 8 for just Rs. 699. Step 6. 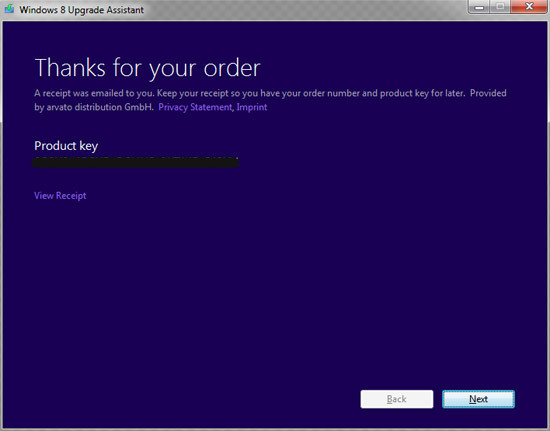 As soon as you buy it, you will be given your genuine key to activate Windows 8. Step 7. Click on the next button and the setup will start download Windows 8 for your system. Grab the offer before it expires and experience the genuine Microsoft product for heavy discounted price. I have read a lot of good reviews on Windows 8. 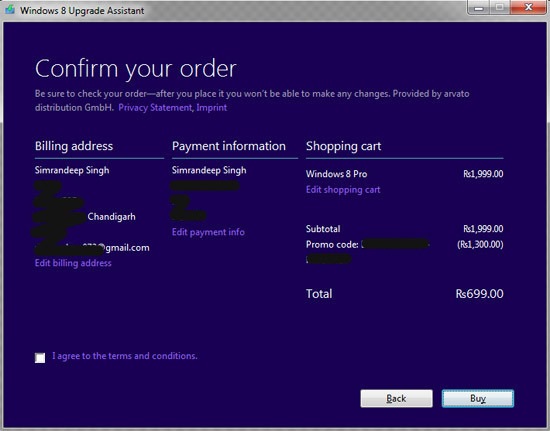 Now is a great chance to upgrade… at RS699, it is really cheap! In the validation tab it asks for Windows 7 product key. Now i dont have one since my windows is pirated, any ways to skip that? It worked for me…I entered my legit product key and i got on offer upgrade. how much time it will take to download with 256kbps bandwidth? Ah 699 it’s really good offer, but I would like to know do we need to upgrade our installed softwares like as I am using Tally for accouting I don’t know whether it is compataible with Win 8 or not. I have a original copy of windows 7 and I have got it before 2nd June 2012. Will this offer work for me if I provide them with the wrong date. And my second question is that my internet connection is slow and gets disconnected in between for sometime. If I will keep the iso file of windows 8 to download and I my internet connection got disconnected in between then shall I still continue with the download…? You can try this offer by providing the wrong information if it works for you. If your internet connection gets disconnected then you can use a download accelerator to download the file so that if your internet connection disconnects in between you can resume the download later. I dont have genuine win 7..
What shall i fill in varification for windows 7 key???? We can download it for 1400 in Pakistan right now.